Lower back pain is a common experience people have come to live with on a day to day basis — almost everyone has it at some point in their lives. In fact, studies have shown that around 31 million people living in the United States suffer from low-back pain. If you suffer from back pain, you have suffered too long and there is no need to live with it every day. 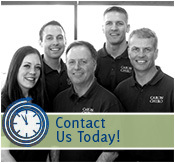 Below is an explanation of how Chiropractic Care at Caron Chiropractic Clinic can help. The back is a intricate structure of bones, joints, ligaments and muscles. Any type of injury, like sprained ligaments, strained muscles, ruptured discs and irritated joints can all lead to back pain. From someone who lifts weights five times a week, to someone simply picking up a pencil off of the floor, back pain can happen to anyone. Aching/stiffness and painful movements that is constant or persistent in any region of the back. Sharp pain in a specific region within the neck, upper back or lower back. The pain is especially painful after lifting a heavy object. Chronic pain or an aching sensation in the middle or lower back, especially after sitting or standing for long periods of time. Troubles while trying to stand straight without having pain or muscle spasms in the back. Don’t Suffer From Back Pain. Caron Chiropractic Clinic Can Help! Caron Chiropractic Clinic has greatly reduced back pain symptoms and conditions for hundreds of patients who suffered from back pain. What makes Chiropractic care different from conventional medicine is that we look for the source of the problem rather than a quick fix. Medications do not always work, and will only mask the problems you are really having. Chiropractic is recognized throughout the world as one of the safest drug-free, non-invasive therapies offered for the treatment of back pain, neck pain, joint pain of the arms or legs, headaches, and other neuromusculoskeletal complaints. Stop suffering from back pain! Call Caron Chiropractic Clinic today at 651-255-9999! This entry was posted	on Wednesday, August 16th, 2017 at 8:34 pm	and is filed under Back Pain, Chiropractic, Chiropractic Treatments. You can follow any responses to this entry through the RSS 2.0 feed. You can leave a response, or trackback from your own site.